For an intimate dinner or private lunch meeting, The Red Room, The Yellow Room or The Wintergarden Room are excellent options. 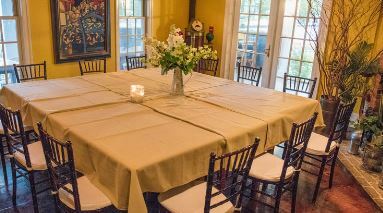 The Yellow Room seats 15-20 guests, and is one of the oldest parts of The Inn, featuring exposed beam ceiling, a large fireplace, and French doors to an ouside porch area. The Red Room seats 12-15 guests, and offers a cozy feel and a large fireplace. The Wintergarden Room seats 20-35 guests, and features wonderful artwork, exposed ledge and a roaring fire.